This waterfront estate, collectively called “The Ringling,” is a massive complex surrounding an opulent residence on the Sarasota Bay. 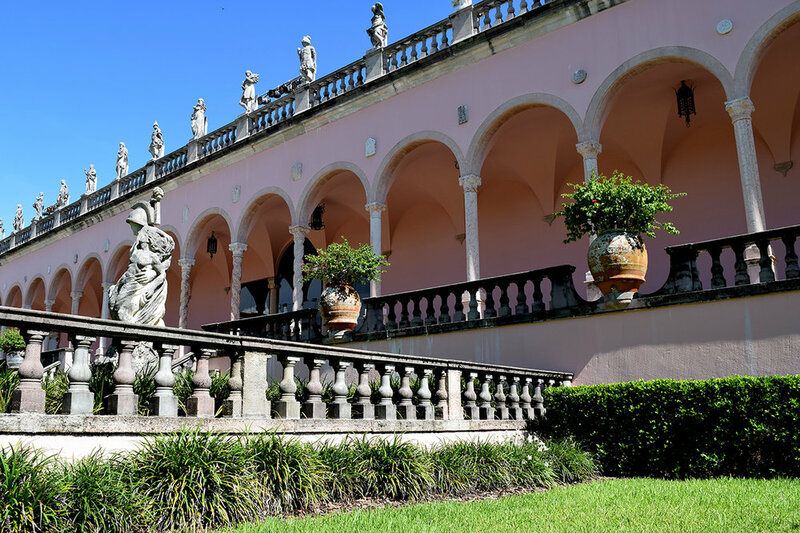 Once the lavish home of John & Mable Ringling, the home, which they named “The Ca’ d'Zan,” is a Venetian Gothic mansion whose style along with the surrounding gardens was inspired by the couple's frequent travels to Italy. People line up for the tours inside the mansion or to see the displays of art and circus history, but I preferred to spend the whole visit wandering the beautifully landscaped property and taking in sights along the water. The first step in my appreciation of the The Ringling was to separate it from all associations with the circus that made that name famous. I am not a huge fan of circuses, with their creepy clowns and maltreated animals, but I soon learned that the Ringling family played an integral part in the development and culture of Sarasota, Florida. The Ringlings fully realized their grand cultural ambitions for the community, but the natural beauty of their home affirms the very reason they saw Sarasota as such an appealing destination. My initial encounter with the property was a trip to the art museum with my grandmother many years ago, on one of my visits down south to visit her. The massive, creamy-pink building made quite a statement and there was plenty of impressive artwork inside, but it was the courtyard of the museum that took my breath away and stayed with me. 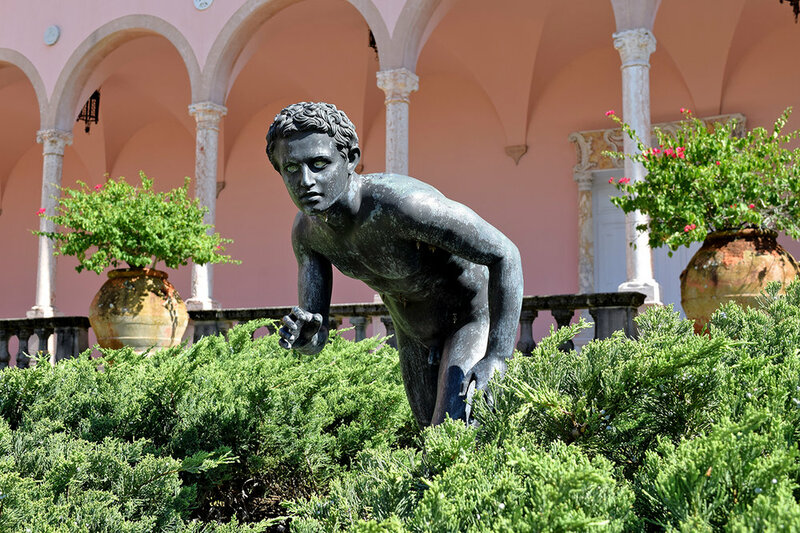 Bordered by the columned walkways of the building, the courtyard consists of an impressive three-level sunken garden, which displays fountains and bronze and stone replicas of famous Greek and Roman statues. Ringling purchased the replicas for the dual purpose of embellishing his numerous properties and to serve as educational tools for his planned art school. The pink hue of the architecture pops against the bright green squares of grass and clipped hedges, and when the scene is set against the usual sunny blue of the sky it makes the whole scene surreal. Giant, weathered terracotta planters, spaced in between archways, hold sprays of bursting bougainvillea which add to the romantic, old-world atmosphere. An orderly row of royal palm trees, silhouetted by the bay beyond, flank a replica of Michelangelo's David—an iconic vista that is so well-known that it is even referenced in the logo for the city of Sarasota. 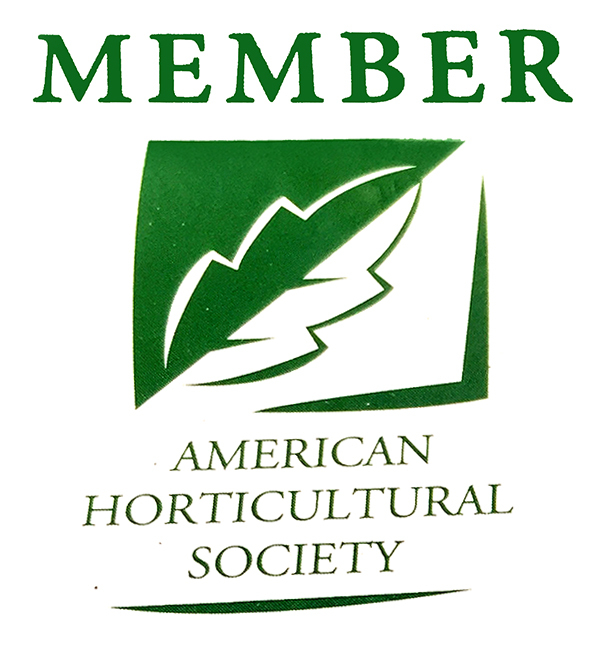 One of the garden’s most notable accomplishments is the rose garden. Mabel Ringling’s first project upon completion of the mansion in 1913 was the creation of a sprawling rose garden, another Italian-inspired design. A grid of flowerbeds featuring 300 distinct rose varieties is interspersed with diagonal walkways that together form a circular wagon-wheel pattern at the center, which is completed by a wrought iron and limestone gazebo. Concrete statues in dramatic poses with weather-worn faces are placed at intervals between the bushes, and free-standing stone columns line the entire perimeter, giving the garden the romantic feeling of ruins overgrown with roses. Not to be outdone by ostentatious flowers, there are some awe-inspiring trees that demand attention as you wind your way between buildings and along the water. Protectively encircling Mable’s Rose Garden, the lumbering Banyan trees stake their claim on the land around them with aerial prop roots stretching toward the ground and strangling nearby trees and statues alike. There are fourteen of these large Banyan trees growing in various locations on the property, some as old as 100 years. Rivaling the Banyans for towering height, giant Slash Pines strike curious yet majestic poses against a blue sky. A newer feature of the Bayfront Gardens is the Millennium Tree Walk, which features many species of native trees that thrive in the unique waterfront conditions, along with other notable and award-winning varieties.